LITITZ, Pennsylvania (WPVI) -- Police officers in a small Pennsylvania town are evidently afraid of a certain homicidal clown. 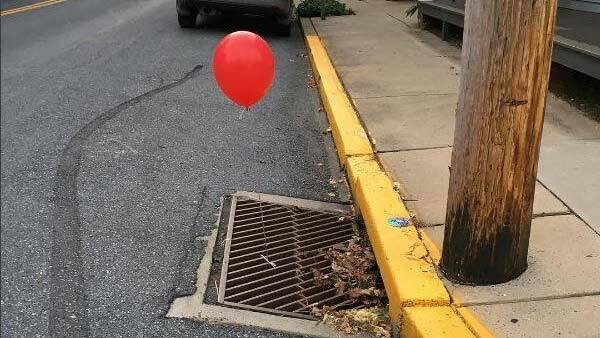 The Lititz police department on Tuesday posted photos of red balloons a prankster tied to a pair of sewer grates. A red balloon is the calling card of Pennywise, the sewer-dwelling, child-eating clown in Stephen King's horror novel "It." The hotly anticipated movie version opens in theaters Friday. In a playful Facebook post , police write they admire the prankster's creativity but were "completely terrified" while removing the balloons and "respectfully request they do not do that again." Police also suggest people watch previews of the movie with the lights turned on and the volume turned low. The police department's post ends with a famous line from the book: "You'll float too."